I absolutely love finding unconventional statement pieces for the house. They usually need some TLC, and that's part of what I love about it. You get to truly make something your own that fits your families needs & vision. This mantel is super special to me because the mantel itself was given to me from a friends home, and it was this orangey brown color. It's so heavy and pretty hard to assemble. So, I stared at it for a month or so before I got up the courage to actually paint and refinish it! Once that was finally complete, I knew I was going to have to figure out a way to adhere it to the wall, and tie it into the room. I came home one evening, and I walked into the house and saw this beautiful mantel & fireplace facade complete and ready to decorate. My sweet husband surprised me by totally completing this project and making it everything I wanted. That's why this is so special to me. And I love that it's such a statement in our home. Reminds me of my guy, and how sweet he is. 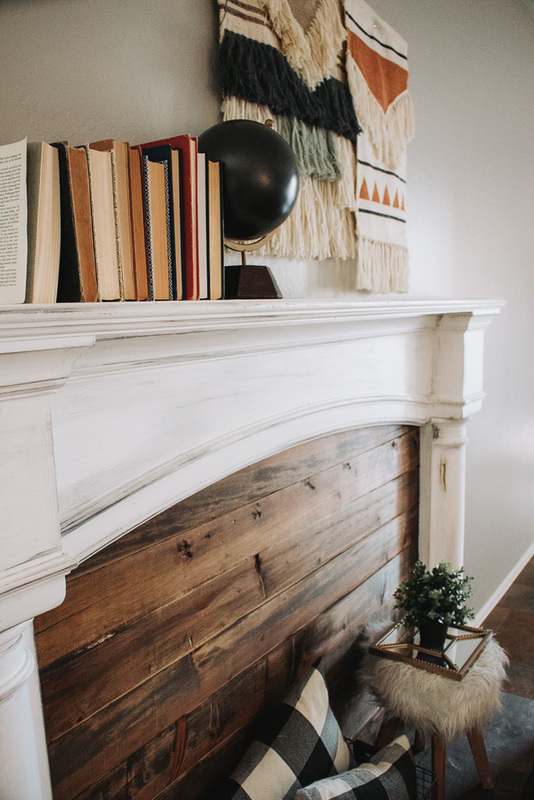 The thing I love about mantels and fireplaces, fake or not- I love how they are so transitional. You can change the styling for any occasion, and they are so versatile. I want to just dive right in and give you my design process & some design tips when it comes to styling a smaller, unique space. Let's go! Books, books, and more books. They are timeless, classic, and always a good idea. I love pairing old books with any type of decor item. They honestly just make your home feel way more "homey." Multiples. Ok, if you ever find yourself with two or three or more of the same general item, they don't have to be identical, but they are the same general thing- COMBINE THEM! I love taking multiples of things and really playing with them & pairing them up! I had that smaller wall tapestry hanging elsewhere in my house, and when I brought home the larger one, I knew I wanted to find a place for them to hang next to each other. They are a great compliment to each other and also tie in some colors with a lot of the neutrals going on in the house. Simple. Keep it simple. 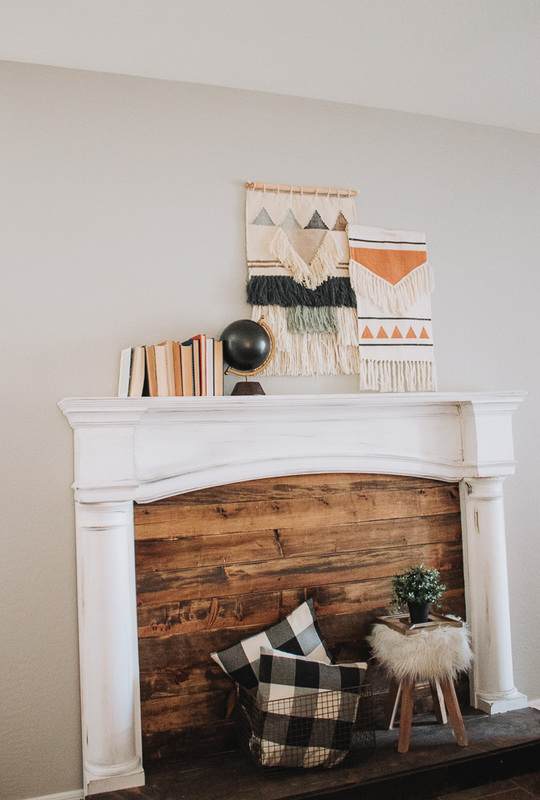 Just because the mantel is 5 feet long, doesn't mean there has to be something on every inch of it. Get creative with how you stack your books. Bindings facing away, facing out. Maybe you want to lay a stack of them down. Play with them until you love the pairing. For the bottom part of the faux fireplace, there's a ledge. So, I knew I wanted to put some complimenting items down there as well. My overall goal was for this space to look "cozy!" I took a couple matching pillows in a pattern that I love, and stuck those in a wire basket. Pillows and blankets in baskets are always a nice accent to any random small space you're dealing with as well. I always like to peek around my house when I'm redecorating and see if there's any items that could use a change of scenery. For me, I spotted this little fur stool that I'm in love with. I wanted it to be a more central focus. Think outside of the box. I have this small set of mirrors that have been in my closet for almost a year now. I never threw them out because I'm a decor hoarder and thought: "there will be a place for them sometime!" I took one of those small frames and set it on the stool and paired that with a plant. Boom. Done. Sometimes I think it's so hard to give design tips and the method to why I designed something the way I did because honestly, it's all trial and error. If you like something, you like it. If you don't, you don't. 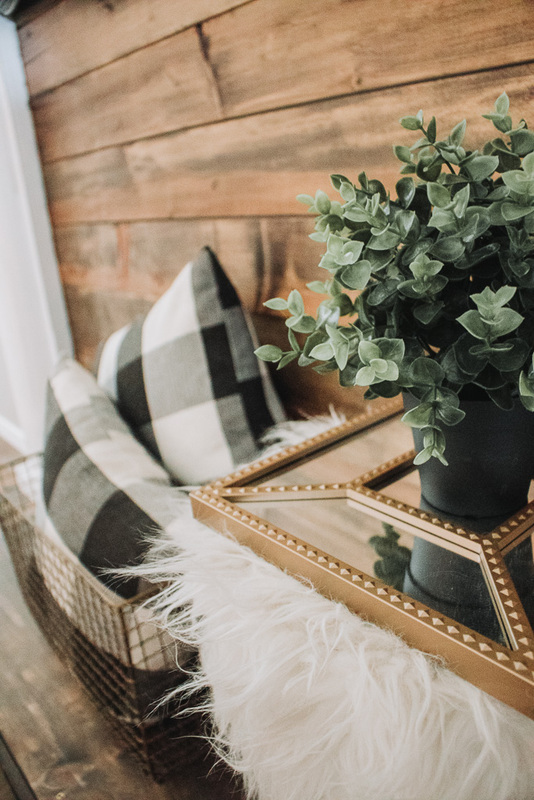 I encourage you today to restyle a spot in your home and allow yourself to get creative! Remember, there's no wrong or right in design. Heck, I put a mirror on a stool and called it good. It's all in the designer's eye, and getting creative is so good for the soul! !